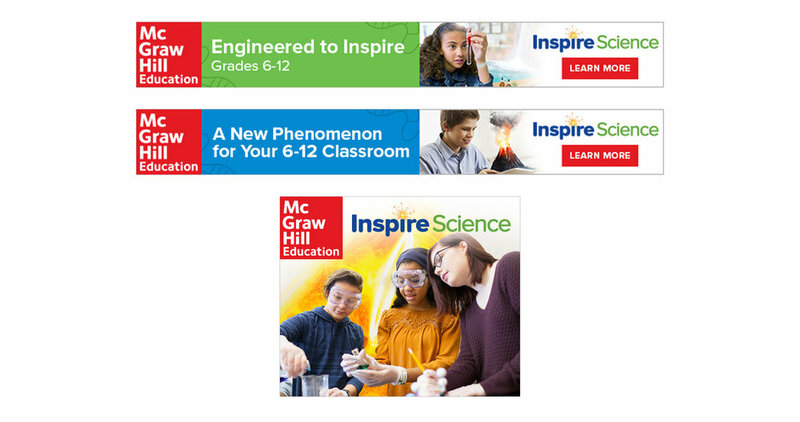 Designer for client, McGraw-Hill Education at Minds On for their Inspire Science K-5 and 6-12 campaigns. Developed concept and designed four sets of email and landing page designs, and created a series of web banner advertisements to market their new K-5 STEM-inspired learning program. Our banner ads outperformed all other ads on NSTA.org (National Science Teachers Association), with a .63% CTR compared to every other ad's .03-.05%. Developed concept and designed four sets of email and landing page designs, and created a series of web banner advertisements to market their new 6-12 phenomena-inspired learning program.